The final price will depend on exact size and details chosen, each cake is quoted on an individual basis. 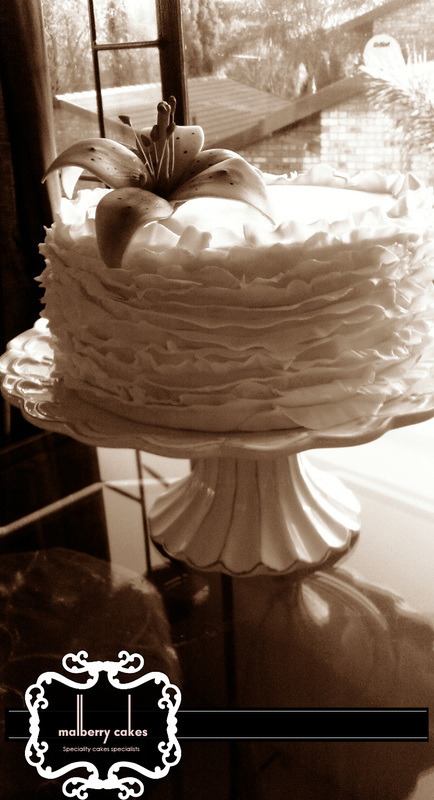 Each decorative piece on the cake is hand made, so you can imagine the time that goes into each piece. The more decorative pieces the more the cake will be. Most of our wedding clients choose designs costing from R1500 for two tiers and R2000 for three tiers. It also depends if you are serving your cake as the desert. If so, you would need a large enough cake for all your guests. If not, your cake can have the style you want, but it can be smaller. If your wedding is less than 9 months away, and you have some of the main styling elements in place, we can begin to design your cake. Most clients come in around three to six months before wedding. Some weeks can book out far in advance, however we will always do our best to accommodate your cake order. Notice required is usually less in winter months. We recommend that you make an initial enquiry by email, giving us your date, delivery location, serving size and design ideas so we can give you a rough price guide. We can book you in for a full consultation and tasting and provide a firm quote. To confirm your order, a 50% deposit is payable, with the balance being due two weeks before the event. For events other than weddings we often work by phone and email to finalise a design and quote, and of course we are more than happy to work by email if you are planning your wedding from interstate or overseas. CAN I HAVE A DIFFERENT FLAVOUR AND FILLING FOR EACH TIER? Yes! You can have as many flavours as you have tiers. All our cakes are covered with a thick ganach to get that straight 90 degree corner. Dark, milk or white chocolate ganach can be chosen. WHY ARE MOST WEDDING CAKES I TRY SO DRY AND BLAND? If the supplier has not taken the time to fully layer, lightly syrup and mask the cake before icing, and then ices in thick fondant, the heavy sugar coating can draw the moisture out of the cake before serving making it unpalatable. We choose not to cut corners in our processes. Our thin icing over ganache technique results in a superior look and taste. CAN I HAVE FOAM “DUMMY” TIERS OR A SMALLER CAKE PLUS KITCHEN SLABS TO REDUCE THE PRICE? For most average sized weddings, it’s just as easy for us to put all your servings into the main cake. Foam is most useful if you love the idea of a really large cake, but only have a modest guest list. As most of the cost is in the decorating, a five tier cake with only three tiers of real cake will still be closer to a five tier cake price than a three tier price. When considering whether to go for a small cake plus kitchen cake, keep in mind the scale of the wedding and the visual impact you would like from the wedding cake. This option usually reduces costs significantly only for larger events, however a small cake may look out of place at a big wedding. Any materials you have from your wedding can help in arriving at the perfect cake design. Invitations, fabric/colour swatches, inspiration boards and images or lists of your floral decorations will all assist in visualizing the look of your day and design a cake to match. These materials will need to stay with us.